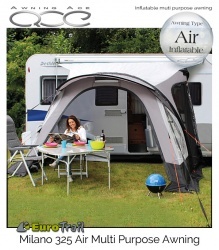 The Eiffel is a simple yet extremely flexible awning designed for either touring caravans or Motorhomes up to 2.6m. 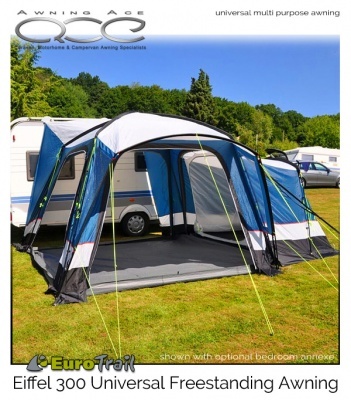 Constructed with dual awning beading to fit standard caravan awning rails with a fitting height of between 240 - 250cm or Fiamma Omnistore roll out canopies with narrow gauge awning channel up to a height of 260cm. A large 3 metre square footprint with a light airy interior makes for the perfect place to sit and relax, entertain or for dining. The extra large front and side panels have large crystal clear windows with internal privacy blinds and secondary mesh mosquito ventilation. The front and both side panels can be completely removed opening the entire awning into a large shady sunroom. The fully adjustable back wall can be opened or closed completely for privacy or storage security. The supplied tub fitting groundsheet offers superb draught protection and ensures your living space remains dry and cosy. 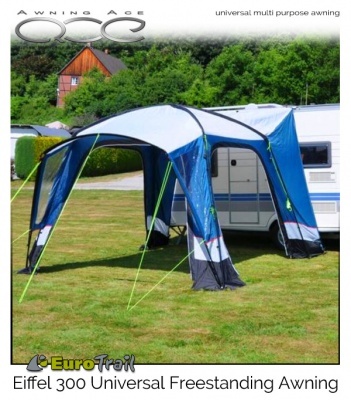 The groundsheet can be completely removed when sites do not allow there use. 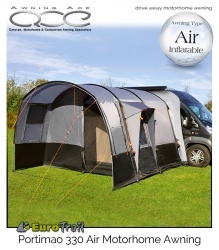 Further weather protection is provided by the large front canopy which helps to keep the elements out during poor weather and offers additional shade on those long summer days. 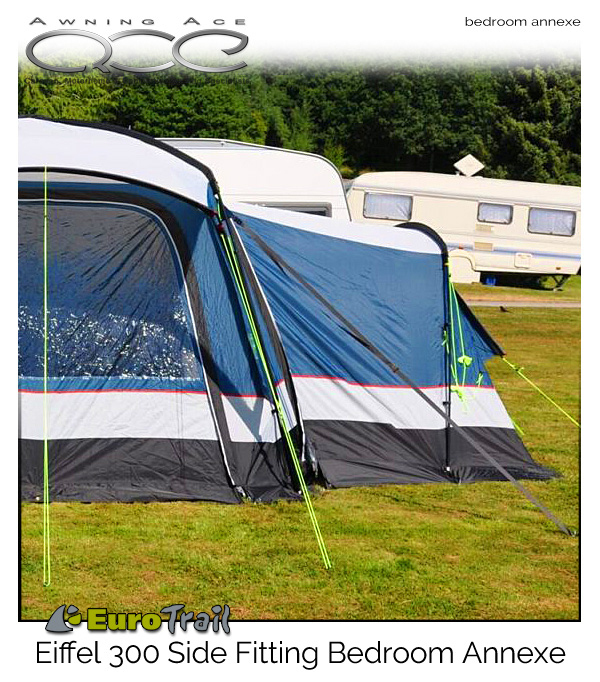 Weighing 22.6kg the steel and fibreglass poles are simple to use making the awning very easy to pitch. The awning fabric is a very durable polyester ripstop material with a large 5000mm hydrostatic head capable of dealing with the British weather conditions. The petrol blue, grey and black colour scheme gives the Eiffel strikingly good looks. 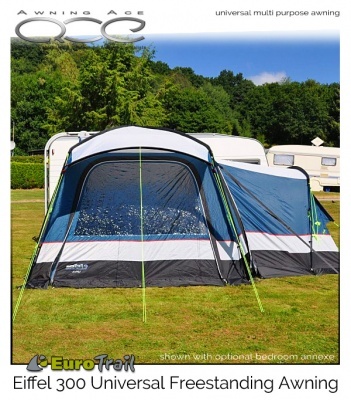 For additional sleeping accommodation, the EuroTrail Eiffel has an optional bedroom sleeping annexe available which simply zips onto either side of your Eiffel awning. 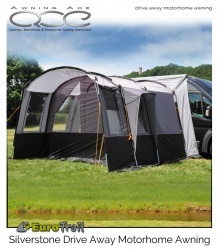 Supplied with groundsheet and two person inner tent, the optional annexe adds an extra bedroom to your awning or can be used as secure storage for your camping gear, bikes, fishing tackle or wet weather gear if required. The EuroTrail Eiffel is ideal for use at the weekend or break holidays on your touring caravans or motorhome adventures. To fit caravan awning rail heights: 240 – 250cm. Poles: Fibreglass to pole 12.7mm with 19mm steel sections. Size: 300 x 300cm plus canopy. Optional 2 person bedroom annexe available. 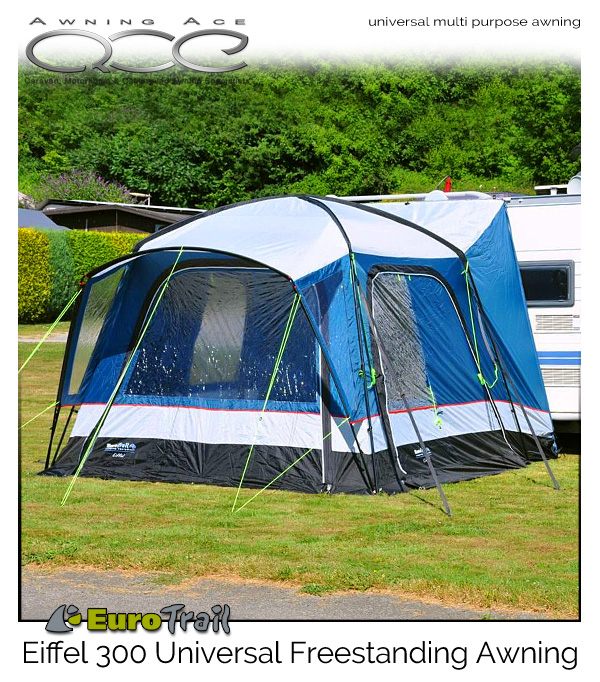 Designed exclusively for the EuroTrail Eiffel Awning this bedroom annexe zips securely to either side of your Eiffel Awning provide additional sleeping accommodation or for extra secure storage.